This free 30-minute training webinar will focus on the core causes of false ABS activation complaints -- and how to diagnose these problems. ASE-certified technician Andrew Markel will cover two false activation complaint case studies, and he will give you best practices on the diagnostic process, from the test drive to confirmation of the repair. The leading cause of wheel bearing hub unit replacement is wheel speed sensor codes and malfunction indicator lights that cripple ABS operation. In some cases, it is difficult to diagnose without performing a complete diagnostic procedure. In this 30-minute training webinar, we'll cover how to track faults at the air gap all the way to the wiring connector at the ABS control module. How are You Inspecting Shocks & Struts? Finding a failed shock or strut is easy, but inspecting a shock or strut for wear is difficult. Communicating the condition of them to the customer can be impossible, unless you have the right tools and knowledge. This training webinar will also discuss how to diagnosis active, hydraulic, and air ride systems. During this webinar you'll hear Andrew Markel, Director of Content for Brake & Front End, ImportCar, and Underhood Service, share his unique insights into the latest TSBs and how they will shape your approach to diagnosing and servicing late-model vehicles at your shop -- now and in the future. When the ABS or ESC takes over during an emergency, it needs a fully functional brake system to carry out the correction. This 30 minute webinar is designed to help technicians understand the connection between conventional braking systems and the ABS/ESC variety in a way that leads to more sound, safer repairs. What Are Your Options For Air Ride Repair? The path to a long-lasting air ride suspension repair can be challenging for technicians. 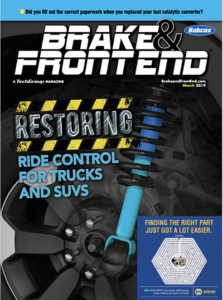 Learn about your options when you are repairing or converting an air-ride-equipped vehicle to passive ride control components. This webinar will also help you become more confident and profitable in selling air ride repair solutions. Hear about some of the common misconceptions many students have about brakes and brake service. 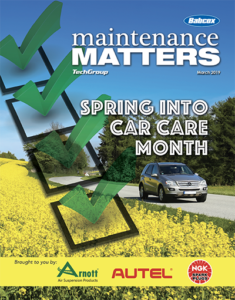 ASE-certified technician Andrew Markel will cover 10 important topics – like the myth that brake rotors warp, what really happens to brake hardware, and why brake fluid matters. Just about every Asian and European luxury import nameplate manufacturer has a 7- to 10-year-old vehicle on the road with an air-ride suspension at all four corners. Chances are one of these vehicles will be coming to your shop sooner rather than later. During this free 30-minute webinar, you'll learn how to inspect and diagnose air ride suspensions on Audi, Mercedes Benz, VW and other import nameplate vehicles. Can You Pass the ASE A5 Brake Certification Exam? Identify potential blind spots you should watch for on the ASE A5 brake certification exam. During this free 30-minute webinar, ASE-certified technician Andrew Markel discusses question types and strategies to help you score higher on the A5. You'll also learn about new questions on stability control, electronic brake proportioning, and electronic parking brakes.